What Can We Do in Chulmleigh? Explore the town’s listed buildings, such as Egypt Cottage. Visit the town’s tearooms and pubs. Picnic on the banks of the Little River Dart. Cycle or walk the Tarka Trail. Take the Tarka Railway to Exeter. Shop for fresh produce in the market town of Barnstaple. Discover ancient stone circles on Dartmoor. Spot wild ponies and deer on Exmoor. Take surfing lessons on the North Devon coast. Walk the South West Coast Path. Where Can We Stay in Chulmleigh? Book a room at one of the town’s inns: The Old Courthouse or the Red Lion. Stay at one of the area’s country hotels. Chulmleigh is a Saxon hilltop market town in North Devon, near the Mid Devon border. It lies near the banks of the Little River Dart, and is surrounded by rolling hills, woods and farmland. 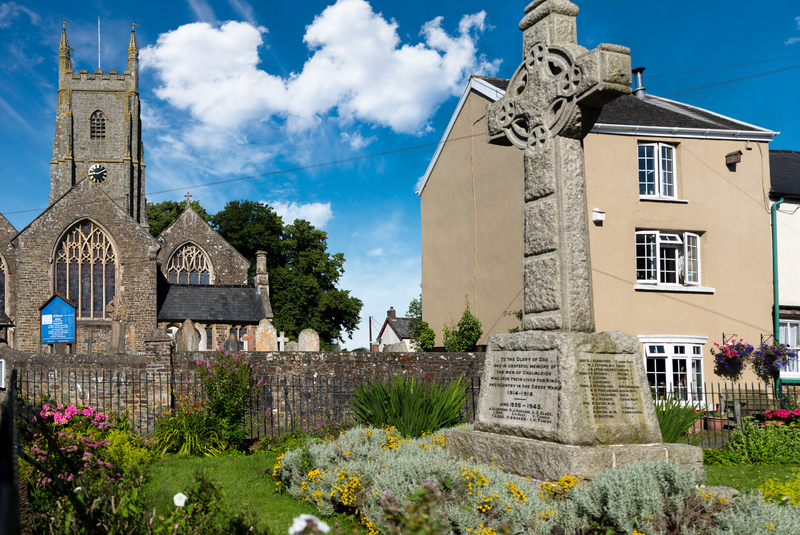 With Exmoor and the North Devon coast to its north, and Dartmoor and the city of Exeter to its south, Chulmleigh is an excellent base for exploring the county. The narrow streets of Chulmleigh are home to more than 200 listed buildings, including many traditional thatched and cob homes. The town centre is home to a variety of family-run businesses, including a grocery, a post office and a newsagent on Fore Street. The Old Dairy Tearoom and Deli serves light lunches, cream teas and local produce, and Chulmleigh Bakery sells fresh bread, cakes and sandwiches. Chulmleigh is known for its independent shops, which include Hilary Johnson Handmade leather shop, Taw Valley model train shop and Changing Blooms florist. The town has two historic pubs: The Old Courthouse, a thatched inn dating back to 1633, where Charles I stayed during his first tour of the Westcountry, and the Red Lion, a 17th century inn with open fires, oak-beamed ceilings and exposed-stone walls. Both serve excellent food and a selection of local ales. The countryside around Chulmleigh is crisscrossed by footpaths and bridleways which pass through fields, woods and meadows, often providing spectacular views across the county. The Chulmleigh Parish is a designated Area of Rural Tranquillity, and an Area of Great Landscape Value. Meandering over Little Dart Ridge, Two Moors Way and Valley Walk, the Tarka Trail is a scenic foot and cycle path which forms part of the national long-distance footpath network. Eggesford Forest is another popular spot for walking and wildlife-watching, where spurge, wood sorrel and wood anemone can be found, and deer and otters are often spotted. Heywood Forest is home to the remains of a Norman motte and bailey castle, as well as rare trees, including Chile Pine and Western Red Cedar. The Culm Grasslands are one of the last remaining habitats for the rare curlew and marsh fritillary butterfly, while the area’s Saxon hedges and copses are a haven for dormice and the Brown Hairstreak Butterfly. Chulmleigh is a couple of miles from Eggesford Railway Station, on the Tarka Railway, which runs north to Barnstaple and south to Exeter, passing beautiful countryside and villages along the way. Barnstaple is a charming market town with plenty of independent shops and eateries, some of the best of which can be found on Butcher’s Row. The cathedral city of Exeter is well worth a visit, with impressive architecture and many of the region’s best restaurants. Directly north of Chulmleigh, beyond the market town of South Molton, Exmoor National Park is a rugged expanse of high, open moorland, fields and woods, frequented by deer and wild ponies. The park is scattered with peaceful villages such as Simonsbath, Lynton and Lynmouth, and has a spectacular coast, the entirety of which is covered by the Southwest Coast Path. Further west, the North Devon coast is home to the sandy surf spots of Croyde, Saunton and Woolacombe. Dartmoor National Park lies to Chulmleigh’s south, with windswept moorland trails and ancient stone circles. Chulmleigh started life as a Saxon village, after the Saxons invaded Devon in the 9th century. In 815AD, Coelmund, a Saxon thegn, travelled to the banks of the River Taw. He travelled north until he found a clearing on top of a hill. Recognising the many advantages of the area, which included good deer and boor hunting, and far-reaching views, he named the area Coelmund’s Leah – ‘Leah’ is a Saxon word for ‘clearing in the forest’ – and the name eventually became Chulmleigh. A charter was granted to Chulmleigh by King Henry III during the 13th century, and villagers started holding fairs and markets. During the middle ages, a fair was held annually, attracting buyers and sellers from across Devon. Wool was woven in the town, much of which was transported to Barnstaple, and Chulmleigh prospered, with a population of a few hundred. During the 18th century, the wool industry declined in Chulmleigh, as it moved to other parts of the UK. Another challenge for the town was being bypassed by a turnpike – a privately owned road that people paid to use – from Barnstaple to Exeter, which opened in 1830. Chulmleigh was also bypassed by the railway between Exeter and Barnstaple, which opened in 1854. In 1803, a fire destroyed many of the town’s buildings. Pound Street was rebuilt and renamed New Street, and it is believed that Egypt Lane’s name may have originated from the presence of gypsies in the town, who were thought to be from Egypt. It is believed that there has probably been a church in Chulmleigh since Saxon times, although most of its present church of St Mary Magdalene dates back to the 14th century. The town is home to some of the region’s finest historical architecture, including more than 200 listed buildings and many cob and thatched homes. Egypt Cottage and Lower Dodyard are among the oldest buildings in the parish. How Do You Get to Chulmleigh? Chulmleigh is a seven-minute drive from Eggesford Railway Station, which is on the Tarka line between Barnstaple and Exeter. Exeter provides direct trains to London and connections to the rest of the UK. Exeter also has an airport, with flights to various cities in the UK and Europe. Bristol Airport is a 90-minute drive from Chulmleigh, providing a wider variety of routes. Driving to Chulmleigh from the east, exit the M5 on the A361 towards Tiverton and Barnstaple, and exit for Chulmleigh. From the west, exit the A386 for Chulmleigh between Okehampton and Bideford. Chulmleigh is a four-hour 30-minute drive from central London and a one-hour 50-minute drive from central Bristol.